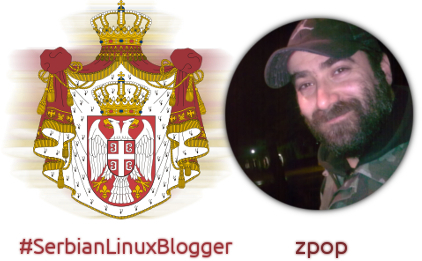 As I announced in the first article, from today I’ll start to introduce Linux bloggers from Serbia. One of the many and unique one of the rare people is certainly Zeljko Popivoda (serbian: ????? ????????). But if you search the internet you will find it easier as zpop. Zeljko is above all father, husband, blogger, Linux Advocate and in large degree FOSS enthusiasts. He likes to write most often in the Serbian language. Advocates for the localization of software and Cyrillic script. Together with Milan Rajacic He is the founder of Ubuntu All In One. It is DVD project that contains the main and most frequently used Ubuntu derivatives in one place. The project continues with packaging Linux Mint versions on one disc. For all those people who like to try out Ubuntu and Linux Mint This is a great benefit and relief. Zeljko is an active member of the local community at Ubuntu for Serbia, moderator at the Ubuntu forum and the representative. This is already turning into a list of praise but Zeljko is the most active member of the Linux Users Group in a local village Lovcenac(serbian ????????). By the way I knew him a long time ago before we met in BalCCon 2K13 First Contact computer Congress in Novi Sad, which is also held this year under the name BalCCon 2k14 Second Base. And what I can say about him is just that every Linux community should have one Zeljko Popivoda. If not entire, then at least one part.